Natalie Hemby plays the Miller Harris benefit tonight at the Bluebird. The Miller Harris Golf Tournament will be Monday, September 14 at Temple Hills Golf Club. Register to play, volunteer or become an official sponsor of the 10th anniversary event. Details at www.millerharrisfoundation.com or by calling (615) 584-7848. The tournament includes a chance to win a Porsche, custom motorcycle, and more. Duet Dreams Come True: A Benefit For The ALS Association will be held tonight (8/27) from 6-9pm at 3rd & Lindsley. It is a night of duet performances, duet karaoke, songs from Doyle and Debbie, ’80s duets by members of Guilty Pleasures and one lucky attendee will get to perform a duet with Linda Davis. ALS is commonly referred to as Lou Gehrig’s Disease. Local event planner Kathleen Chandler Wright, whose father was diagnosed with ALS, spearheaded the event. Tickets are $20 and can be purchased at www.3rdandlindsley.com, 1-866-468-3401 or at the door. Details and an online auction with autographed items from Carrie Underwood, Tim McGraw, Peter Frampton, and more at www.duetdreamscometrue.org. Three country performers are gathering this weekend at the Nashville Palace to raise money for the United Warrior Survivor Foundation (UWSF). Keni Thomas, Ty Herndon and Jamie O’Neal will perform Saturday, August 29 at 8 p.m. Proceeds will benefit the organization established to aid Special Forces widows with support, bereavement and future planning. Tickets are $10 at the door. Breast cancer is no laughing matter, but International Man of Comedy Tom Rhodes along with Beth Donahue, Brian Bates and Shawn Tidwell invite you to get Tickled Pink. The show hits the Belcourt Theatre on Friday, September 18, at 7:30 pm. A portion of the evening’s proceeds will benefit the Susan G. Komen For The Cure Greater Nashville Affiliate. Sponsored by the Moosehead and Alice Crafts, CPA, LLC, tickets are on sale now for $25 at www.belcourt.org. 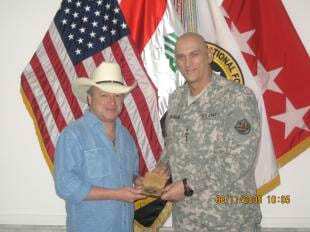 Mark Chesnutt headed overseas this month as part of the Stars For Stripes summer concert series. He performed for service men and women stationed in Iraq and Kuwait. Chesnutt was also presented with a commemorative coin called the Challenge Coin as a “thank-you” from Gen. Ray Odierno, Commanding General, Multi-National Force, Iraq. The eighth annual Bruce Burch and Friends Concert Honoring John Jarrard will bring another talented group of songwriters to Gainesville, GA on Sept. 24. The concert at Brenau University includes John Berry making his third appearance, Steve Cropper, Jimmy Hall, Roger Cook, Buddy Cannon, Gary Nicholson, Burch and Allen Nivens. John Jarrard was a Gainesville native and Nashville songwriter who wrote songs for performers such as Don Williams, Alabama, George Strait, Diamond Rio and Tracy Lawrence. Jarrard battled diabetes before passing away in 2001. The concert honors Jarrard and benefits local charities like the Boys and Girls Clubs of Hall County, Leukemia & Lymphoma Society Georgia Chapter, the Georgia Mountain Food Bank, and the University of Georgia Music Business program.